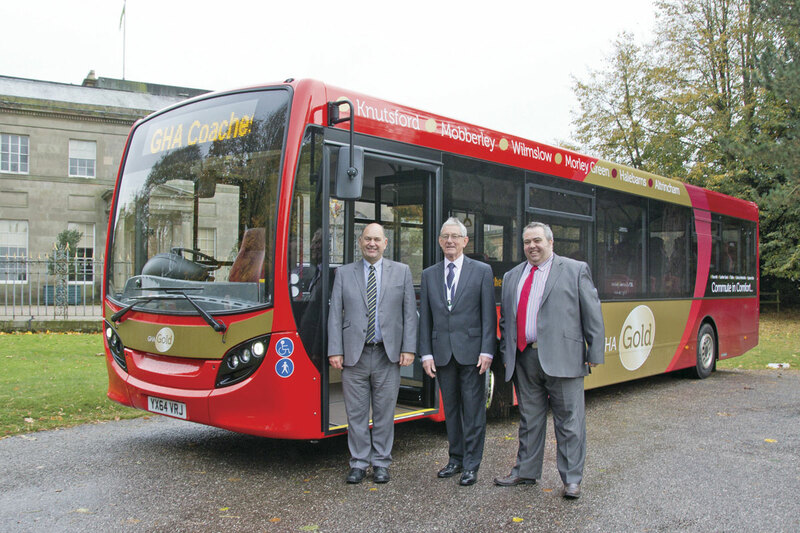 GHA Gold was formally launched by (LtoR): Glen Bubb, Transport Co-ordinator, Cheshire East Council; Councillor Rod Menlove, Cheshire East Council and Stephen Bryce, General Manager, GHA Coaches. From its origins in Wrexham, GHA Coaches has been quietly growing in recent years to become one of the largest family owned business in the UK bus and coach industry. The next stage in the company’s development was revealed last week. GHA Gold will be its premium brand featuring new high specification vehicles and improved service provision. 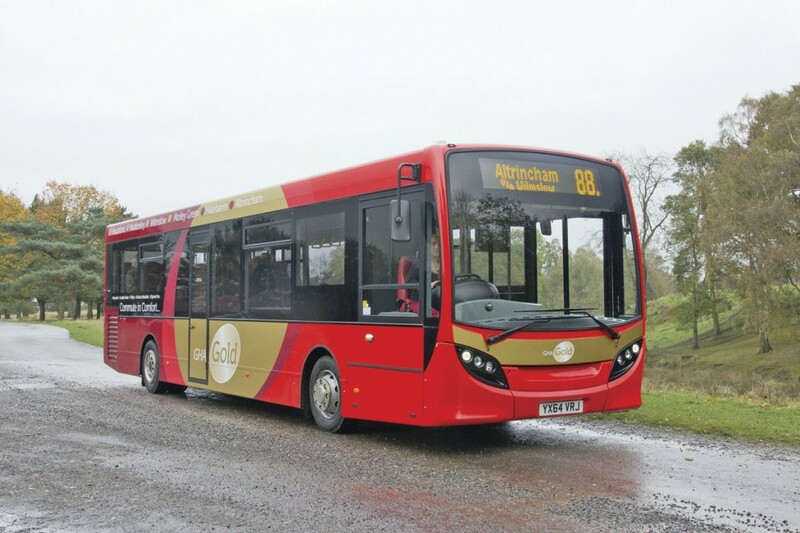 The first service to be upgraded to GHA Gold specification is the 88, a Cheshire East Council (unitary authority) route linking the prosperous towns of Knutsford and Wilmslow with Altrincham, where connection is made with Manchester’s Metrolink system. 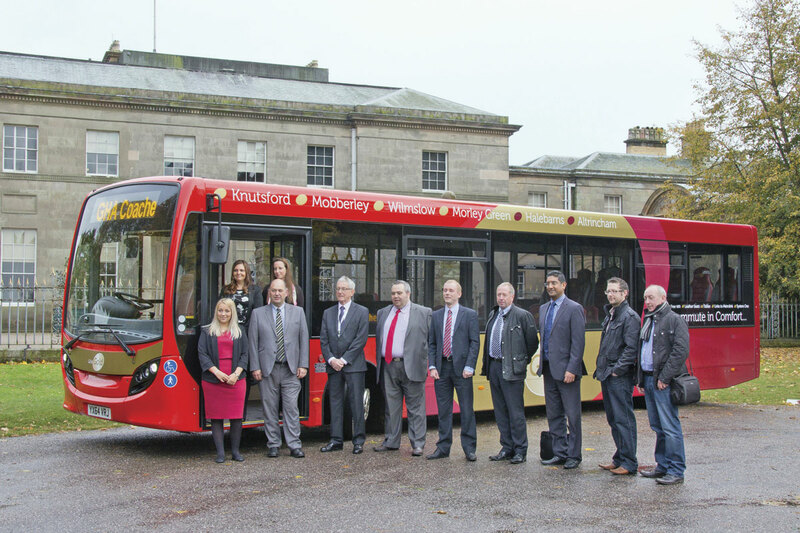 The brand and upgraded service were formally launched at Tatton Park, a Cheshire East managed but National Trust owned property, by GHA’s recently appointed General Manager, Stephen Bryce, and Cheshire East Councillor for Wilmslow East, Rod Menlove, in the presence of suppliers, local stakeholders and the media. Welcoming guests, Stephen introduced the new brand as part of GHA’s objective to ‘change people’s perception of public transport’. He spoke of the company’s exciting plans for the brand with further GHA Gold services to be rolled out during the coming year. In reply, Rod praised GHA’s commitment to providing a high quality service for Cheshire East making particular reference to the improvements in vehicle standard and service frequency. He passed on positive feedback he had received from a local resident who had praised the authority for the forthcoming frequency improvement. The four vehicles required for the 88 are the first deliveries from an order placed with ADL for GHA Gold specification vehicles. 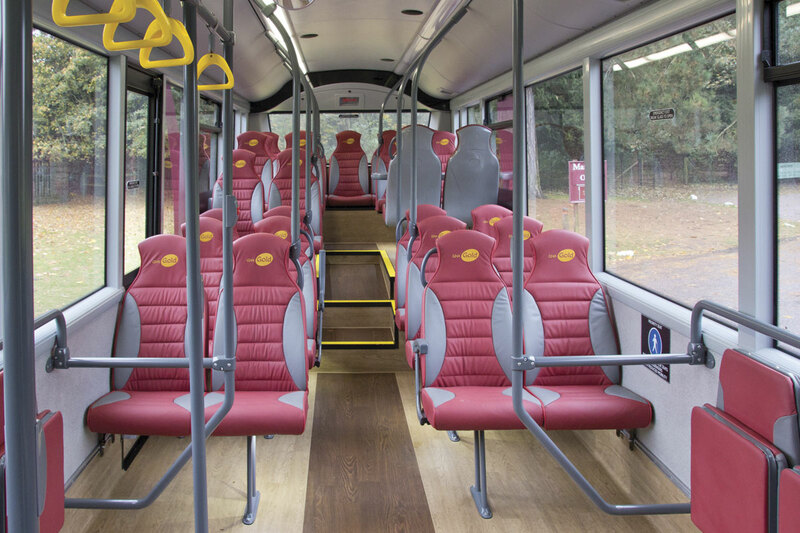 The 10.8m Enviro 200s feature 37 Lazzarini high back seats trimmed in Muirhead real leather with one pair of seats over the rear wheelarch reversed to accommodate a table. 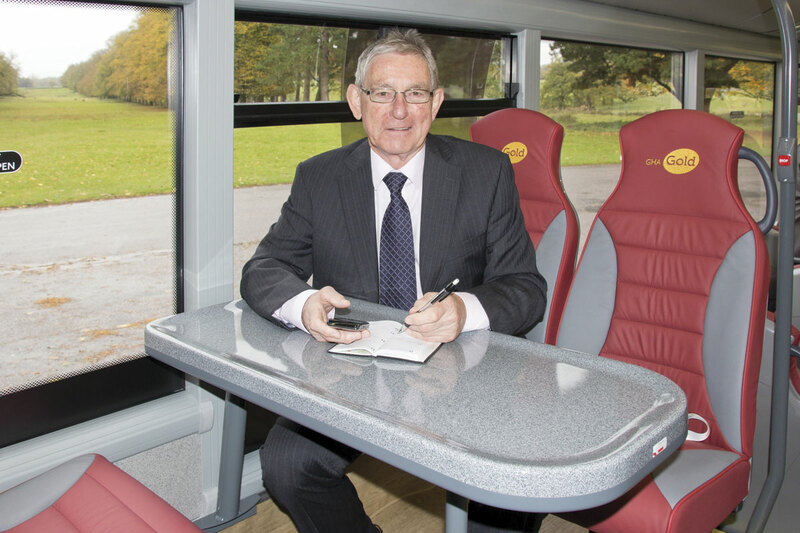 This is particularly aimed at providing commuters with a convenient workplace during the journey. The seats incorporate the GHA Gold motif embroidered into the leather headrest material and the KAB driver’s seat is trimmed in similar material. The high specification also includes Hanover Displays destination equipment, wi-fi, CCTV, two TFT screens supporting audible and visual next stop announcements and GPS real time tracking. The appeal of the vehicle’s high quality interior is completed by Altro wood effect flooring. Mechanically, the vehicles are to Euro5 standard with Cummins ISBe four-cylinder engines and Allison transmissions. Along with the rest of the GHA fleet, the vehicles will be fitted with Greenroad telematics systems as part of the company’s drive for high levels of safe operation. 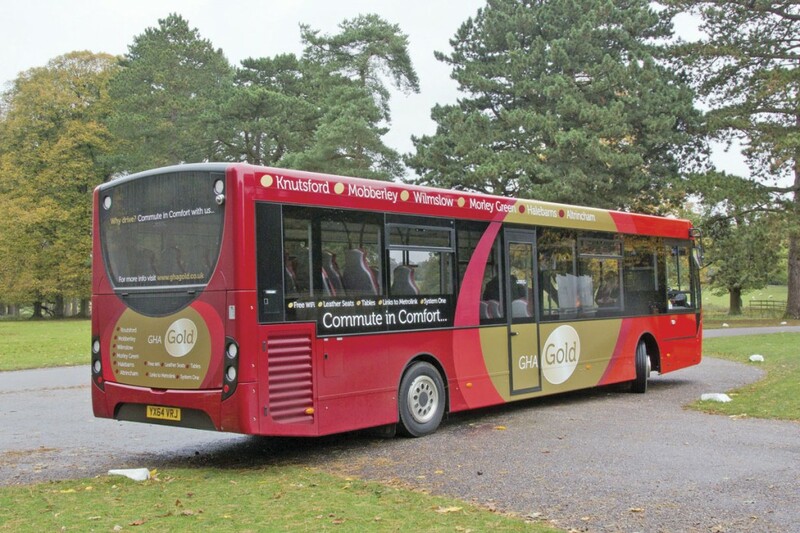 The GHA Gold livery and branding has been developed by Sure Signs UK, based in Wrexham, close to GHA’s headquarters with input from Cheshire East. Sure Signs UK has been a regular supplier of vinyl signs to GHA but the development of the brand, encompassing publicity and roadside information as well as the vehicle livery, is a first for the company. One of the vehicles will be exhibited by ADL at EuroBusExpo 2014 before joining the other three which were due to have entered service on 27 October. 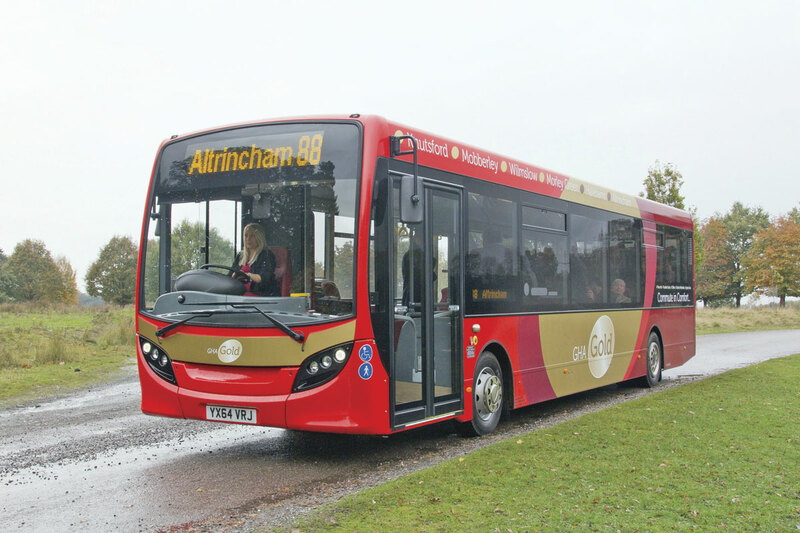 GHA’s relaunched service 88 provides Cheshire East with an increased frequency for less support, linking Knutsford with Altrincham half hourly between 0640 and 1825 on Monday to Friday with one journey less each end of the day on Saturdays. Alternate journeys divert through Morley Green north of Wilmslow and there is a double run in Wilmslow to serve the railway station. Easy interchange to Metrolink is achieved at Altrincham’s new bus station although with space in the latter at a premium, meeting scheduled departure slots is critical. Day and weekly tickets are available, valid across most GHA services, with an introductory weekly ticket offer at £10 (normally £19) available for the first four weeks of GHA Gold operation. GHA have set what they consider sensible and achievable growth targets with particular emphasis on appealing to the commuter market. Part of the service’s promotion with Cheshire East has included one of the vehicles visiting Waters, Wilmslow’s largest employer, and the distribution of details about the service on that company’s intranet. System One travelcards are accepted within the Greater Manchester area. The 88 is a key service for Cheshire East Council and one of a significant number now provided by GHA Coaches. In common with authorities throughout the country, Cheshire East faces funding cuts across all areas but has chosen to tackle the situation in an alternative way. After considering outsourcing, the authority has opted for an ASDV (alternative service delivery vehicle) in the form of wholly owned limited companies for each of the authority’s areas of responsibility. As well as driving greater financial accountability, this should also allow these areas the freedom to undertake other work on a commercial basis. The companies are currently being set up with that for transportation services, TSS (Transport Service Solutions Ltd) on course to be operational from 1st January 2015. Councillor Rod Menlove will take on the Chairman’s role for the new company. Amongst other companies being set up are those covering waste, funeral services and the management of Tatton Park itself. The Council’s proactive support in rebranding the 88 is part of ongoing developments to strengthen relationships with bus operators in the area. With a fleet now approaching 250 vehicles, GHA Coaches Ltd remains a family business run by brothers Gareth and Arwyn Lloyd Davies, Joint Managing Directors, from the headquarters in Wrexham. Operating out of six depots, the company’s bus operations span North Wales, Cheshire East and Cheshire West with routes projecting into surrounding counties. Vehicles carry a variety of liveries including route promotional liveries for local authority supported operations and the retention of the identity of Bryn Melyn, one of the many operations acquired in recent years. Coach hire using vehicles in a silver livery with red and burgundy branding is offered throughout the company’s operating area.